Travel to the past, present, and future to make it to the exit in this first person time travel puzzle game. In this project I was the level designer, I created the designs for the three levels, the first two based off of suggestions for ideas from Sammy and Taylor, and the final one by myself. I also built the environments in UDK, applied textures, did the lighting, and some kismet scripting. In this project we were tasked with creating a game with at least three challenges and incorporate time travel in three weeks. We decided to make the three challenges three different levels of a first person puzzle game where the way to progress is to get to the exit. To do this the player needs to move between the past, present, and future of a room to change it in the other time periods. The first two levels were meant as tutorial levels each teaching the player what they would need for the third level which was designed to be much harder and if put in a full game it would come around halfway through the game. The goal of level 1 was to introduce the player to the time travel mechanic through a very basic puzzle where the bridge is broken in the future and in good condition in the past. Starting in the future the player comes across a bridge that cannot be crossed. Nearby there is a time pad which takes players to an in between time zone where the player can choose which time period they travel to. By going to the past the player is able to cross the bridge and proceed to the next room. The goal of level 2 was to teach the player that each color time pad only goes to its corresponding time pad. This means that if a time pad were to move in a different time the player would be transported to whatever location said time pad is in. In this level the player enters in the past and sees a patch of dirt with a sign that shows a tree growing. The player needs to explore other time periods to find an acorn, they then go to the past to plant it and then in the present they can use the time pad that grows on trees. Taking that time pad to the future the player finds the tree has grown and they are able to get to the top of the wall and proceed to the next room. The goal of level 3 was to create a much more difficult level than 1 and 2 while still using the principles taught in levels 1 and 2. The player needs to get to the exit, marked on the diagrams by an orange door. This is behind a locked door that opens when the player uses the switch marked with a black trigger icon. To get to the switch the player must travel to the present. Once in the present the player has access to the red time pad and can use it to go to the future where they will be at the top of the platform and able to unlock the black door with the black switch. For a diagram of this see any of the previous beginning future diagrams where the tree with the red time pad is up. Now the door is open and the player needs to find a way to get to the exit. To do this the player must grow a tree sideways from the soil near the orange time pad and use its time pad to get into the area where glass blocks jumping, but allows trees through. The player must then grow another tree from the soil near the blue time pad and use that as a bridge to the exit. However the player must first find a seed to plant for the first sideways tree. 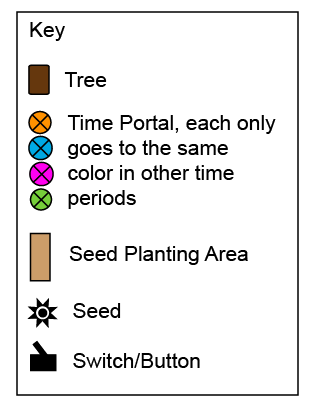 To find this the player will have to go to the past and take the seed from the tree they used to get to the black switch and plant it near the orange time pad. Once the seed has been planted the player can go to the present where the tree will be growing and use its time pad to make it beyond the glass. The player is now behind the glass and can pick up the seed and use the pink switch which raises the pink platform and the green time pad which is on the pink platform. The player then takes the blue time pad to the past and plants the seed. From here the player gets out of the glass area by using the stairs that were added to the game after the diagram was made to make this easier. Once out of the glass area the player must take the green time pad to the future where the pink platform is raised and the tree is fully grown. They then step onto the tree and walk to the exit.